Scott Family McDonald’s will create a better everyday life for our guests: serving an outstanding food experience exceeding McDonald’s standards with Quality, Service, Cleanliness & Value. Scott Family McDonald’s will be recognized as the best quick service restaurant by McDonald’s and the community. Email us your resume or Click To Apply. What’s next for you? Are you considering a career change or interested in America’s Best First Job? The success of our stores starts and stops with our team! Our managers and crew work together to create the best experience for every person, in every interaction, every minute of every day! McDonald’s is leading the industry in technology, customer experience and everyday innovations! Have you got what it takes to lead the way? The Manager’s job is a big one! You will serve thousands of guests. You will manage hundreds of crew. You will protect our brand! McDonald’s leaders come from everywhere. Whether you’ve led a tem of 1,000 people or your home of six; you are a LEADER! 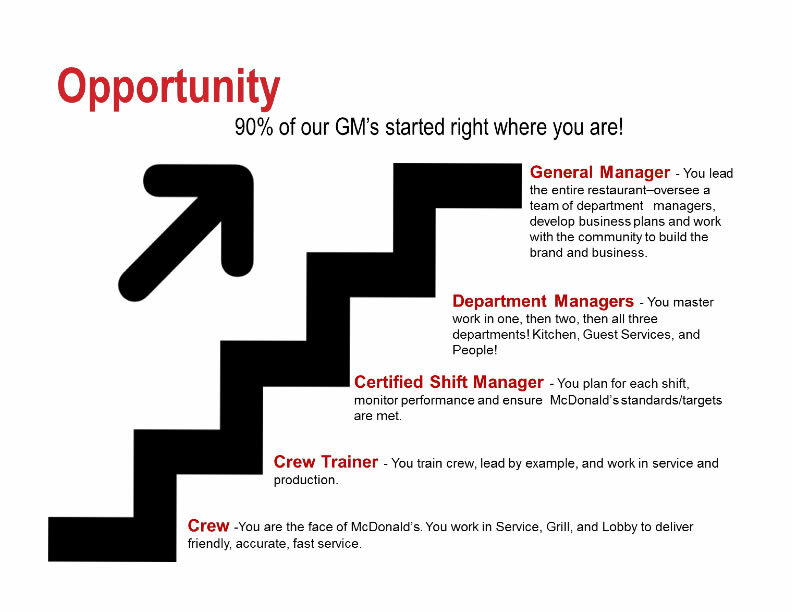 You will lead, develop and grow a team that epitomizes the Scott Family McDonald’s culture. Our crew are the smiling faces the customer sees at the front counter, the friendly voices on the speaker in the drive thru, the people in the kitchen cooking and preparing delicious food or the ones who help keep the restaurant sparkling clean! Their job is an important one and we value it! 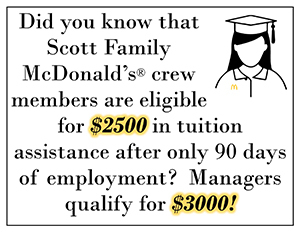 That is why Scott Family McDonald’s offers perks and benefits that you won’t find anywhere else. We know you’re not just looking for a paycheck. Our world class training, flexible schedule and employee appreciation programs set us apart. Open interviews Monday-Friday from 4:30-5:30pm.